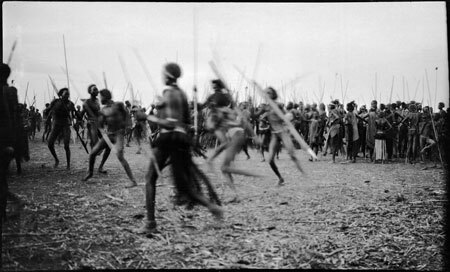 A group of Nuer men and women at a dance, holding spears, dance sticks and wearing dance clothing, men rushing in the foreground. Dances were regular social events, often also accompanying ceremonies such as marriages. Such events were the main arena for courtship among Nuer youth, and often took the form of mock battles and display between village groups. Morton, Chris. "Nuer dance gathering" Southern Sudan Project (in development). 03 Jan. 2006. Pitt Rivers Museum. <http://southernsudan.prm.ox.ac.uk/details/1998.204.5.24/>.